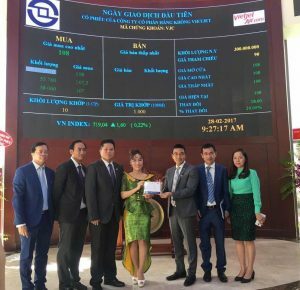 Vietjet has officially listed on the Ho Chi Minh City Stock Exchange (HOSE), becoming the first Vietnamese airline to join the exchange. Nguyen Thi Phuong Thao receiving the ATO (At-The-Open Order) symbolic order from HOSE representative. Vietjet has a chartered capital of VND3 trillion (VND90,000 per share), which equates to a capitalisation of VND27 trillion (equivalent to US$1.2 billion) – some 1.5% of HOSE capitalisation as of 15 February 2017. 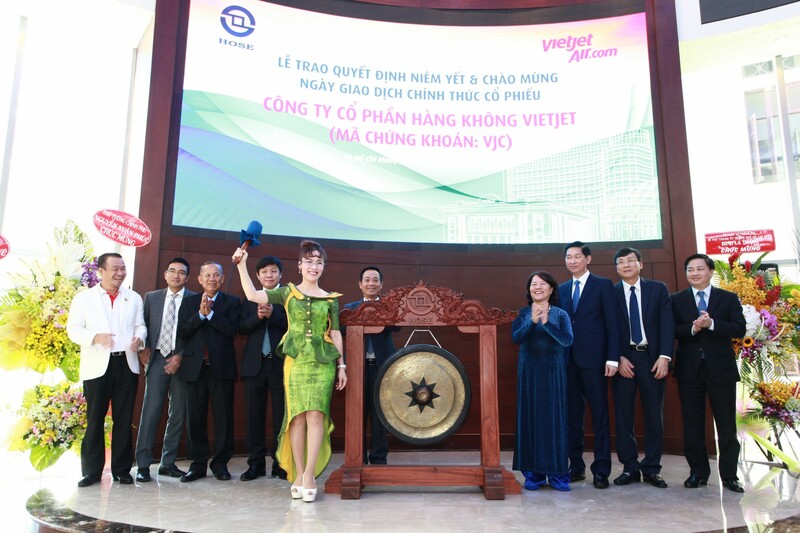 The airline will now join the ranks of ‘VN 30’, Vietnam’s biggest publicly-traded companies in terms of market capitalisation. Vietjet is the first Vietnamese company to have completed an IPO that meets international standards and practices (Reg S). BNP Paribas, Deutsche Bank and JP Morgan are the IPO’s foreign joint global consultants. Twenty-four international investors subscribed to Vietjet’s offering, including Singapore sovereign fund GIC, Wellington, Morgan Stanley, Dragon Capital, VinaCapital, and more. According to 2016 statistics, Vietnam’s aviation transportation market grew by 29% between 2012 and 2016, and the rate of customers using airplanes as their means of transportation increased from 0.5% in 2012 to 0.8% in 2016. Vietjet’s Chairwoman, Mrs. Nguyen Thanh Ha signing on the listing’s traditional book. Vietjet’s revenue in 2016 was VND27,532 billion (USD1.21 billion) with a net profit of VND2,394 billion (USD105 million), with an earnings per share of VND8,762. “Vietjet shall maintain a continuous and high growth rate and we believe that there will be a brighter future in the air for our passengers, the airline and its investors. Vietjet is leading the way in becoming an airline with high-quality services and efficient management as well as a listed company that meets best standards and practices in Vietnam and internationally. In addition to delivering new values to our passengers, we wish to bring new added value to our investors as well as for Vietnamese and international markets as well,” said Vietjet’s President and CEO, Nguyen Thi Phuong Thao.